Guinea fowls are medium sized birds that belong to the Numididae family. There are 6 species of guinea fowls that are native to Africa. They inhabit jungles, forests, grasslands, shrublands, savannas and semi-deserts. 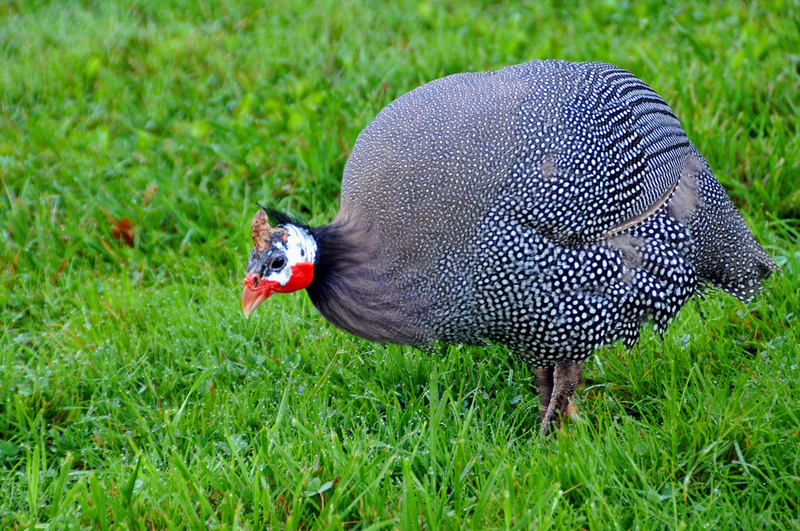 Take a look below for 24 more fascinating and bizarre facts about guinea fowls. 1. Guinea fowls are very adaptable birds. They’re able to live in the lowlands and on altitudes of 9,800 feet. 2. 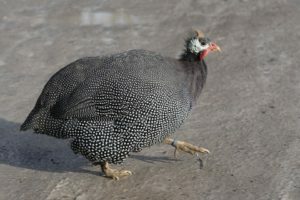 Some species of guinea fowls, such as the helmeted guinea fowl, have been domesticated and can be found on farms all over the world. 3. They have a bare head and neck, while the rest of their body is covered with dark grey or black feathers with small white dots. 4. They can reach lengths between 16 and 28 inches. They usually weigh between 1.5 and 3.5 pounds. 5. Guinea fowls have a short, stout bill, a bulky body, short, rounded wings, thick legs with large toes and powerful claws, and a short tail. 6. While they can be found in high altitudes, they’re primarily a ground dwelling bird. It spends the majority of its time searching for food. 7. They’re mostly active early in the morning and late in the afternoon. It hides and rests during the hottest parts of the day. It gets rid of excess heat through its bare head and neck. 8. Their diet primarily consists of worms, insects, reptiles, spiders, berries, seeds, tubers, roots and grains. It can also survive for a long time without any water. 9. They sometimes follow large herds of animals and collects food that they leave behind. 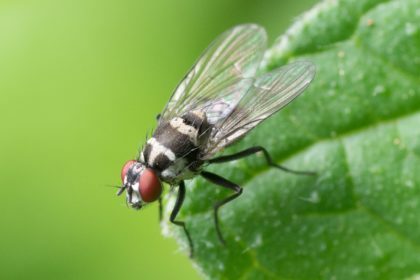 It plays a very important role in control the amount of ticks, flies and scorpions in the wild. 10. Even though they’re a ground dwelling bird, they are strong flyers. However, it still prefers to run away when there’s a predator after it. 11. Guinea fowls are social animals that like to live and roost in flocks. They will often walk in a single line imitating the behavior of the dominant male in the group. 12. It’s natural predators are wild cats, wolves, snakes, crocodiles and humans. 13. Their mating season takes place at the end of the rainy season. 14. Guinea fowls are monogamous birds that form pairs which can last a lifetime. However, some species only form pairs during the mating season. 15. Female guinea fowls lay between 8 and 15 eggs and incubate them for 24 to 30 days. 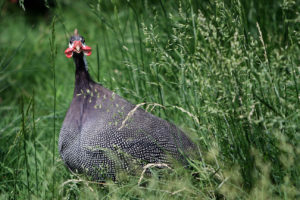 Only the female guinea fowl will incubate the eggs, while the male guards the nest. 16. Their offspring are known as “keets,” and they fledge when they’re 4 weeks old. Once they are 2 months old, they will return to the flock with their parents. 17. Guinea fowls reach sexual maturity when they’re 2 years old. Females will produce many eggs due to numerous predators that target nests, such as cats, dogs, and mongooses. 18. Only 50% of guinea fowl eggs ever manage to survive the incubation period. 19. Their lifespan varies between 10 to 20 years. 20. 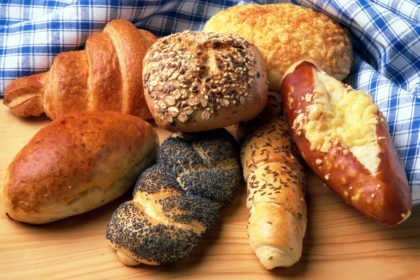 Many people raise guinea fowls for their eggs, which are higher in protein than regular chicken eggs as they are thicker with more yolk than egg white. 21. They are raised as a food source in many countries and are considered a delicacy by some. Their meat is mostly dark and moist with a bit of a wild flavor. 22. Guinea fowls were first domesticated by Ancient Romans and are still farmed to this day. 23. Helmeted guinea fowls are both monochromatic and monomorphic, which means that they look and act alike. 24. During breeding season, the male and female guinea fowls will call to each other at the same time.